Switching to BiomethaneHelping you connect your gas to grid. 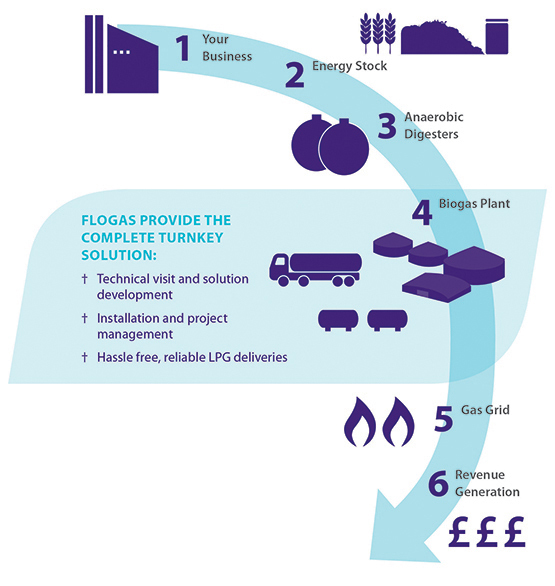 As the market leader in propane enrichment of biomethane, we’re the only LPG company who can provide a complete turnkey solution; from the design and install of an injection system that suits your business needs - liquid or vapour systems, to the reliable delivery of LPG. The upgrading of biogas into a commercially viable biomethane offers the opportunity to inject this green energy source back into the national grid. For this to happen the biomethane needs to reach the gas quality standards as set out in the Gas Safety (Management) Regulations 1996. Typically natural gas in the UK grid contains 90% methane, with a calorific value of about 39.5 MJ/m3. Biomethane on its own characteristically has a methane content of up to 98% and a calorific value of 36 MJ/m3. In order to match the two energy sources, biomethane needs to be ‘spiked’ with a gas with a higher energy content, such as propane. We provide the complete turnkey solution; from project design and install through to hassle free reliable LPG deliveries. By the end of 2014 we will have carried out 16 gas to grid installations. This clearly illustrates our commitment, capability and expertise. Our excellent nationwide infrastructure and automatic top-up service means you’ll always have the LPG you need.